Sleep trackers are plenty, but generally, they come in a form that is permanently attached to your wrist. Not sure about you, but often that is one extra thing to worry about while I am trying to sleep. If your fitness watch or sleep tracker is chunky, that adds its own distractions to the mix. 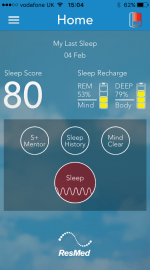 The S+ by ResMed tries to counter that problem by providing you with a sleep tracker that is essentially ‘no contact’. 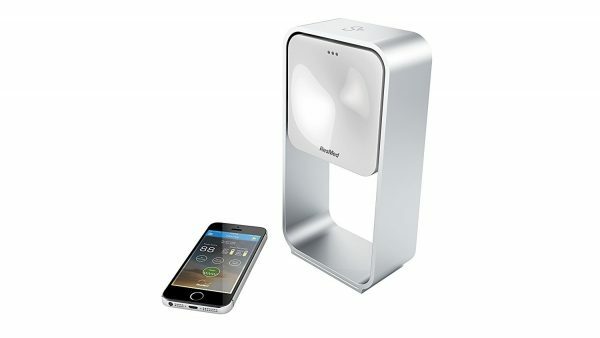 It sits by your bedside and records your sleep. This is done by looking at breathing patterns. 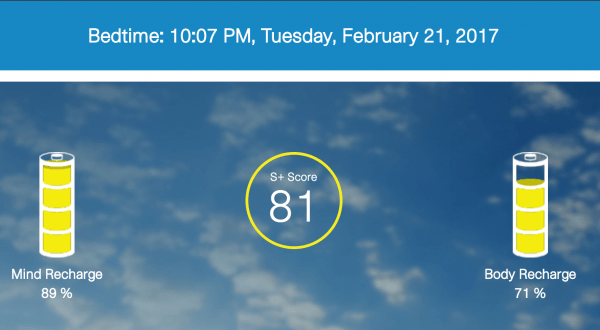 It also records other metrics, such as light levels, temperature and noise, so it knows whether external conditions may be affecting your sleep quality. Apart from tracking the quality of your sleep, it also provides you with ways to help you fall asleep (more on that in a bit) as well as gives you tips on how to improve your chances of getting a good night’s rest as well. The device is essentially a big square that is about an inch thick, which is housed in a frame to help you adjust the angle. The angle is important, as it needs to be able to ‘look’ at you while you sleep. Of course, you are welcome to take it out of the frame and position it as you feel fits your needs. On the back is the power input via a micro USB port. The frame itself is fairly sturdy, and I have never really worried about it falling over. On the front are status LEDs. Red to indicate that it isn’t connected to a device (i.e. phone), green to indicate a good connection, and nothing to show that it is recording your sleep. Of course, the flaw in the plan is that it may also be off in case the power got disconnected. In a way, the LED is a rather good way of reminding you to turn the sleep tracking on before you fall asleep. Otherwise, a rather annoying red or green LED will be glaring at you. The setup for the device is fairly standard. You start with installing the app on your phone. Like most fitness products, you follow by creating an account and entering data about yourself. This is helpful in analysing your sleep and giving you the best tips. From there on, you pair the device to your phone, and you’re pretty much good to go. The device comes with a dual USB charger and a micro USB cable. The charger itself only supplies 1A. The S+ needs about 100mA. Rest can be used to charge your phone or similar device. Annoyingly, these days that is not quite enough, especially if you want to charge a tablet. This is interesting as the device comes with strict instructions to only use that charger. I didn’t follow those instructions and found that the device worked perfectly well with my standard USB charger. Of course, you may find that the charger is perfectly adequate for your needs. As soon as the device connects to the phone, the Sleep button and the device icon on the top go green. You hit the Sleep button to ‘initiate’ your sleep. You can also try and set up a smart alarm as well as set up sounds to go to sleep to. Sadly the delay between pressing the Sleep button and the next screen was fairly consistent. From there, you should be able to see the green LED go dark, and able to fall asleep as per normal. As soon as you press the Sleep button, you are given sound and light levels to help adjust external settings. You can also get the device to produce calming sounds to help you fall asleep to. These include the sound of the sea, the wind, etc. I tried that, and while it seemed to help me once, it also felt a bit annoying the next time I tried it. It uses your phone to produce those sounds and sadly doesn’t come with a built-in speaker. I have also noticed that the app itself keeps the screen on while you try and sleep. Pressing the power button can help, but it can be extra light in your room. The device itself tracks your sleep by watching you breathe. Interestingly, it works pretty well under a duvet and doesn’t need to be able to see your chest move to track your sleep. It also tracks lots of data around your sleep. The following numbers are produced and are accessible both via the app as well as the S+ website. 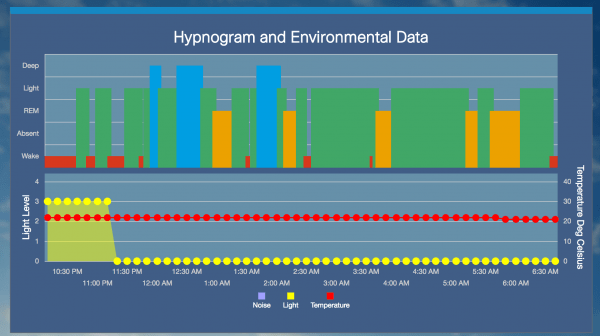 It starts by giving you a general overview of what your sleep levels were like. Which is followed by a detailed timeline of your sleep as well as light/noise/temperature levels. Followed by some sleep metrics. Finally, some advice and mentoring on how to sleep better. This can include random facts like above, or it can be something like ‘exercise more’, or raise your core temperature by taking a shower/hot bath around 90 minutes before bed time. Generally, the device is very easy to use, and once setup, you just need to hit Sleep to begin, and Stop Tracking to look at your sleep. Going through a stressful couple of weeks has made me feel like I am not very well rested. However, the device keeps giving me advice and generally indicates that I am sleeping well. It has identified some areas that need improvement, such as falling asleep. Interestingly, it also highlights that I keep waking up during the night, and don’t sleep through. It doesn’t seem to mind that as far as scoring goes. Being a number nerd, I think it helps. The advice it gives me is good, but I don’t think it has made much of a difference. What has really made a difference is that it makes me think about the stress, exercise, drinking and similar factors as I go to sleep. This means that I automatically try and avoid the bad and try and do more exercise to help me sleep. More information on the S Plus by ResMed can be found on their website. It is available via Amazon and retails for £99 at the moment, but will return to its standard price of £129 soon. The device is great for those who want to track their sleep but don’t like to wear extra things on their arms/wrists. It does take up a lot of room, and not everyone may have a bedside table or room on it to spare. Hardware wise, that makes it a bit of a hit and miss. On the upside, the data it provides and the mentoring is spot on.